In the forceful, staggering poetry of César Vallejo, poet/photographer Gerard Malanga discovered a kindred spirit. Driven by a deep sense of spiritual kinship and with the encouragement of Vallejo’s widow, Malanga’s translations reveal a profound perspective on Vallejo’s work that brings into focus the brutal desperation behind his genius. 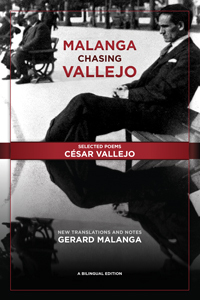 Malanga Chasing Vallejo gathers 82 of Vallejo’s poems in a bilingual edition that is marked by the spiritual connection between poet and translator. A work of the heart, Malanga presents the work from the position of a fellow member of the underclass, providing a street-level entry point for readers who can relate to the hunger feeding every verse, and the ache of loneliness that no amount of modern technology can obscure. In addition to the poems, Malanga’s heartfelt introduction, describing the process of his 45-year commitment to this project. The book also includes a poem about Vallejo by Malanga, rare photos of Vallejo, and transcriptions of several never-before-published letters to Malanga from Vallejo’s widow, Georgette de Vallejo, which guided his translation efforts. Gerard Malanga is an acclaimed as a poet, photographer, and filmmaker. He was born in the Bronx in 1943. He is the author of a dozen poetry collections, the most recent being No Respect: New & Selected Poems, the four-volume fanzine set: AM: Archives Malanga, and Tomboy & Other Tales. His photography books include Resistance to Memory and Screen Tests Portraits Nudes. He was a founding editor of Interview magazine, alongside Andy Warhol. Malanga lives in upstate New York. More information is available on his website www.gerardmalanga.com.